The British Summertime…the season we all eagerly wait for and where so many various events take place and we plan so much around the weather. 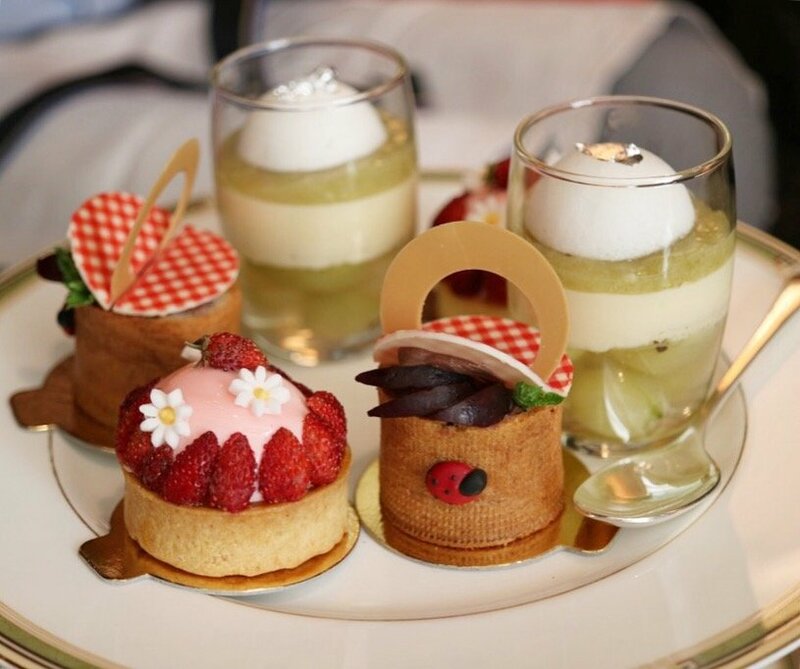 The Four Seasons London have created an Afternoon Tea called ‘A Journey Through British Summertime’ which pays homage to all the highlights of summer, which you can enjoy in the gorgeous Amaranto Lounge. We were invited to try this Afternoon Tea and I was so excited about it, having seen a few sneak peeks on Instagram. We started off our Afternoon Tea experience with a glass of Veuve Clicquot, Rosé N.V. Champagne but you can opt for the Veuve Clicquot, Brut N.V. Champagne or if you still want the feeling of having bubbles without the alcohol, you can opt for So Jennie, Alcohol Free Rosé Sparkling Wine. Having Rosé was a lovely change from the usual Brut. As a side note, the Four Seasons also have a Veuve Clicquot Secret Garden where you can enjoy Champagne, Cocktails and Tapas style dishes. Definitely worth checking out as its gorgeous and perfect for summer. Soon arrived the tiered stand, my favourite moment of an Afternoon Tea, and this stand was stunning. The top and middle tear held beautiful dainties, all themed around the British Summer, whilst the bottom tier had a selection of finger sandwiches, in lieu of the scones, that usually can be found on the bottom tier. However, there is a perfectly good explanation for that which will be revealed later. Starting with the two sweet tiers, there was the cutest Chocolate Cherry and Licorice Choux picnic basket complete with a miniature ladybird, which represents classic British picnics enjoyed in the Royal Parks. In honour of the old days of Motor Racing at Goodwood Revival, there was a Peach and Ginger Mousse with Redcurrant Coulis and Crunchy Pistachio, presented in the popular British Racing Green colour. When we have a good summers day we must raise a glass, and celebrate for those days are rare and the Champagne Jelly with compressed Gooseberries and Elderflower Cream pays ode to the great British Summertime. One of the prettiest events of the season is The Chelsea Flower show and what better to represent it than an Apricot and Lavender Tart with Orange Blossom and Yogurt Cream. I loved the fresh and floral flavours of this sweet treat and it was also such a pretty presentation, with British Wild Strawberries. Finally, The Wimbledon Tennis Ball created with Brittany Sable and Vanilla Mousse and Strawberry to bring nostalgia about Strawberries and Cream. Utterly divine and stunning in design. All the sweet selection was so novel and so clever, and I loved the cute details with each one and how well thought out they were. The Sandwich selection was also delightful, with our dietary requirements fully taken care of (no fish or crab), and so we enjoyed the Highland Wagyu Salt Beef Bibb Lettuce with Horseradish Cream and served in Rye Bread, A Hafod Cheddar Branston Pickle in Granary Bread, a Persian Cucumber Mint with Lemon Balm and served in Brown Bread, a Pickled Daikon and Nantais Radish, Bibb Lettuce with Horseradish Cream on Rye Bread and a Grilled Asparagus, Caper, Tarragon and Asapargus Butter on White Bread. They were all really delicious so it was a little hard to pick a favourite, but I think the Pickled Daikon and Nantais Radish, Bibb Lettuce with Horseradish Cream on Rye Bread was definitely a winner for me. What I loved was that the ingredients for the sandwiches are from hand picked British producers chosen by the Chef, some of which are small artisan family run producers. For example, the Highland Wagyu, is supplied by a Husband and Wife Team from a farm in Scotland, and the Hafod cheese is also supplied by a couple, who work at a family farm in Wales and use milk from Aryshire cows to make this delicious hard cheese. Once we had thoroughly enjoyed our sweet and savoury treats, out came freshly baked plain and Raisin scones, which were warm, and served with Yorkshire Rhubarb and Vanilla Jam, Strawberry Elderflower Jam and Clotted Cream. The Jam is made by a family made Jam company, established in the mid-90s called Tea Together. The Jam, which is heavenly, is made using whole fruit and raw cane sugar. The treats didn’t end there, and our final surprise was a Lemon Cake with Rhubarb Compote and Pistachio Daquoise, which looked fantastic and tasted superb too. I love Lemon cake or lemon anything in the summer and this was the perfect way to end a fabulous Afternoon Tea. It is definitely one to experience, as you can relive some of your favourite summer memories through it! The tea served is JING Tea which I also love! ‘A Journey Through British Summertime’ Afternoon Tea is served daily from 1:30 pm to 6:00 pm (last seating at 5:30 pm) in Amaranto Lounge and costs GBP 42 per person or GBP 55 including a glass of Veuve Clicquot Brut Champagne. That chocolate cherry and liquorice choux has got me really intrigued! I love the attention to detail with the little ladybird -so cute. The Four Seasons just do the best afternoon teas! This sounds really rather magical – and I love the idea of an alcohol free sparkling wine!